Does the order of names on a ballot affect vote choice? Developed by Katie Brown in coordination with Josh Pasek. American elections are traditionally held the first Tuesday in November. On this first Tuesday in November, we present a post on ballots in honor of elections. Ballots list all candidates officially running for a given office so that voters can easily choose between them. 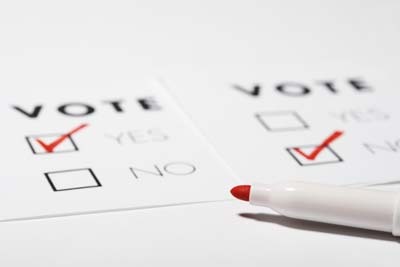 But could the ordering of candidate names on a ballot change some voters’ choices? A new study by Center for Political Studies (CPS) Faculty Associate and Assistant Professor of Communication Josh Pasek suggests just such a possibility. Pasek studies the impact of new media and psychological processes on political attitudes, public opinion, and political behavior. In a forthcoming paper – with Daniel Schneider, Jon Krosnick, Alexander Tahk, Eyal Ophir, and Claire Milligan – Pasek considers the effect of ballot ordering on election results. The study uses data from all California elections between 1976 and 2006. California randomizes the order of candidate names on ballots by district, creating a natural chance to test this question. Pasek and his colleagues analyzed the data in a variety of ways. No matter the approach, candidates listed first on the ballot had a slight advantage. This effect was largest for races (1) with little publicity, (2) when more votes were cast, and (3) when there was a bigger win. These factors support the idea that name order may influence those with minimal information about or investment in the race. The graphs at the bottom of this post show this advantage for contests with (a) five candidates, (b) four candidates, and (c) two candidates. 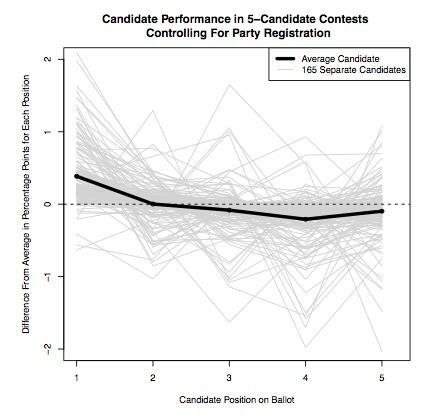 The horizontal axis shows the position of each candidate on the ballot. 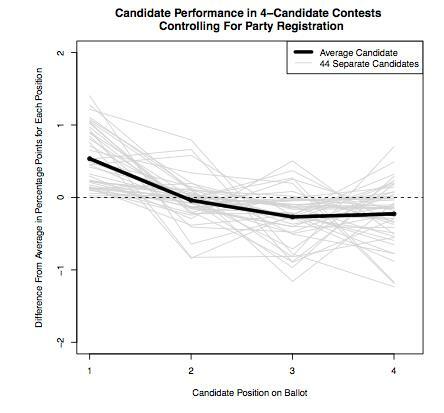 The vertical axis shows how that candidate’s votes would be expected to change. 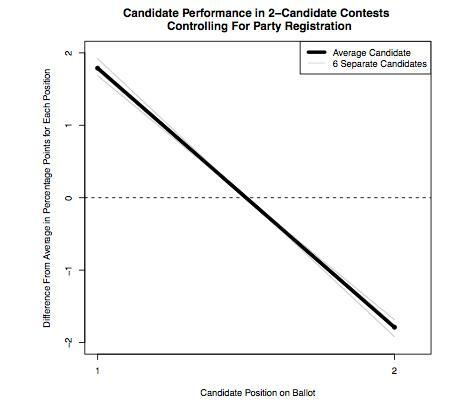 As we can see, candidates tend to perform best when listed in the first position on the ballot and worse when listed farther down on the ballot, with the exception of the last spot on the ballot where there is a slight rebound. Although the overall size of the effect is small, Pasek notes that the size of the effect is far greater than the margin of victory in many elections. For example, George W. Bush beat Al Gore by less than 0.009 percent (a few hundred votes out of six million cast) in Florida in the 2000 election for the President of the United States. Randomizing the order of names on a ballot may therefore be important for ensuring a fair, democratic process. This entry was posted in Elections, National on November 5, 2013 by David Howell.